All solvents act as 'dissolvers' or thinners in oil paint, but there are differences between them. Many customers ask, so we thought we'd post some information about each one. Gum Turpentine is the most common solvent used in oil painting. It is 100% distilled and comes from living, pine trees. Fresh gum turpentine is clear and has an odor. It has a shelf life, however, and will turn into an amber color and become rancid over time. Gum turpentine that has 'turned' should be thrown out as it can harm your painting. It is the strongest of the solvents so it the best one to use when making mediums and varnishes. A draw-back when used alone to dilute oil paint, though, is that it leaves behind a small residue and if over-used it can separate and crack when the painting dries. The big minus with gum turps is that it is very toxic and highly flammable and many artists get an allergic reaction to it. It can also cause permanent health problems. Mineral Spirits such as Turpenoid and Sansodor, are petroleum by-products. Their advantages are that they are as clear as water and stay that way. They will never yellow and do not leave a residue when painting thinly. They are also low odor. The draw-back is that they aren't quite as strong as gum turpentine so are not as good for mixing up mediums and varnishes. However, they are great for thinning your paints and cleaning your brushes. Citrus Solvents are made from distilled citrus peel and are very fragrant. They can also be used to thin your paint and clean your brushes. Some artists prefer the smell over gum turpentine. They are also less toxic. Odorless Solvents are just that; completely odorless, which means that you can paint in an enclosed space without ventilation and virtually no odor. They are still toxic however, and you should avoid contact with your skin. Their vapors will still get into your nose and eyes so this product should also be used with caution. The Australian brand, Archival has a slower evaporation rate to other odorless solvents, so that can be a health benefit. Archival solvent will also keep your paint 'open', longer due to its slower drying time. The main function of odorless solvents are to dilute your paints and clean your brushes. 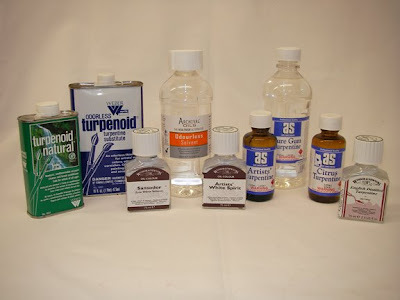 Turpenoid Natural is an alternative to all of the above. It is non-toxic and non-flammable. It was designed as an effective brush cleaner and conditioner, but it can also be used as a painting medium. When added to your oil paint, it makes the paint water soluble, so clean up is a breeze. The draw-back is that it is more expensive than the other solvents that we stock, but it is perfect for the artist who has health concerns. And, it smells really good! For more information about all these products and more, stop by and see us! Great information Jim. The turpenoid natural is a great brush cleaner. Even if oil paint has dried on your brush overnight it will re condition the brush. By the way, Bob, We will place an order today for your book and toys. More and more people are asking for them!